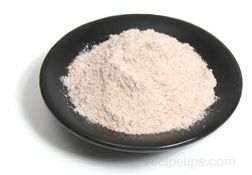 A type of whole-wheat flour that is slightly coarser than regular flour. The Rev. Sylvester Graham, an early advocate of healthier foods, developed the flour. He was specifically interested in the beneficial uses of bran in the diet and believed that bread should not be made with highly processed flour, but with whole-grain flour.